LAS VEGAS – September 21, 2018 – Barrett-Jackson will be home to an impressive group of Chevrolet Corvettes and Camaros during the 11th Annual Las Vegas Auction at the Mandalay Bay Resort and Casino, Sept. 27-29, 2018. From classic to late-model versions, some of the finest examples of these purely American performance cars will race into the hearts of enthusiasts during the three-day, premier automotive lifestyle event hosted in the Entertainment Capital of the World. 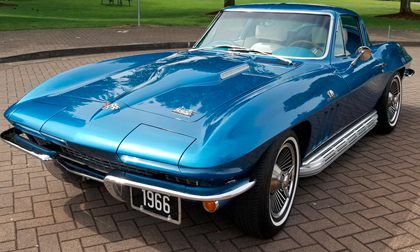 Among the most anticipated Corvettes on consignment is a ’66 Corvette 427/390 (Lot #766), which is one of only 20 Sting Rays with a 427/390 engine and Powerglide automatic transmissions. A one-of-a-kind Resto-Mod ’67 Camaro RS convertible (Lot #669.1) was professionally built and features custom exterior and interior upgrades throughout. Corvettes crossing the Las Vegas Auction block will include models from the first generations to the latest versions rolling off the assembly lines. A few of the classic Corvettes include a ’58 “Fuelie” Convertible (Lot #665) that is a part of the Bryan Frank Collection and is a fine example of an excellent-driving, detailed and well-sorted Corvette. An NCRS Top Flight Award winner ’67 427 Convertible (Lot #747) was restored by Elwood Thorpe and only has 71,750 original miles. Finished in International Blue, a ’68 Corvette convertible (Lot #668.1) features a 427/390 Turbo Jet V8 with 51,600 original miles. Late-model Corvettes in Las Vegas will include a ’12 Callaway Grand Sport Convertible (Lot #642). This 25th Anniversary Edition is #12 of 25 built, and produces 620 horsepower, the most of any LS3-powered Corvette. With only 155 actual miles, a stunning 60th Anniversary Edition Corvette 427 (Lot #643) is equipped with the carbon-fiber package, 60th Anniversary Design Package, 60th Anniversary Stripe Package and 1 SC Package. A track-inspired ’16 Z06 C7.R (Lot #685) only has 1,400 actual miles and is #42 of 500 built. Some classic Camaros that have been consigned for Las Vegas include a ’69 Pro-Touring version (Lot #779), which is powered by a LS2 V8 with FAST LSX intake. Lot #731 is a new, ultra-high performance, no-expense-spared custom ’71 Camaro Resto-Mod. This show car is a chassis-up build that took four years, featuring custom or fabricated workmanship inside and out. A ’15 Bandit Edition custom Trans Am (Lot #776) was built from a ’15 Camaro and is #75 of only 77 built, and is signed by Hollywood actor Burt Reynolds. Lot #484 is a one-owner ’10 SS Hennessey Coupe outfitted with a 650-horsepower supercharged package with 70,000 actual miles. Powered by an 800-horsepower supercharged V8, a ’13 Stage 3 ZL1 (Lot #483.1) features premium Alcantara interior, upgraded exhaust and premium wheels. One of 57 produced, a ’02 Camaro SS Pace Car Convertible (Lot #804.1) includes a Window Sticker autographed by American motor racing celebrity Linda Vaughn. Click here to browse the 2018 Las Vegas Docket, including other incredible Chevrolet Corvettes and Camaros set to take center stage at the Barrett-Jackson Las Vegas Auction. Advance tickets and All-Week ticket packages are for the 11th Annual Las Vegas Auction are available at Barrett-Jackson.com. Consignments for the 2018 Las Vegas Auction are now sold out. Consignments are now being accepted for the 2019 Scottsdale Auction; to submit an application, click here. For information on becoming a bidder, visit www.Barrett-Jackson.com/bid. Also, follow Barrett-Jackson on Facebook, Instagram, LinkedIn and Twitter for the latest news and information heading into the 2018 Las Vegas Auction.